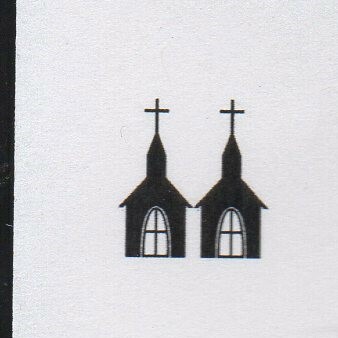 Why even bother looking at how comedies present the church or clergy, if it was all in fun? Don’t you get it? 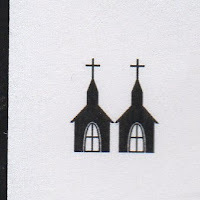 This week and next, we’ll be looking at two comedies that satirize religion. Even though both were made decades ago, they’re still watched. 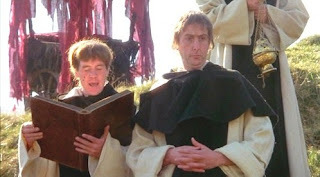 People are still quoting Monty Python and the Holy Grail (1975) and The History the World Part 1 while Monsignor (1982), The Runner Stumbles (1979), and even the slightly more recent Priest (1994) -- dramas with hard hitting takes on the church -- are long forgotten. Those comedies have rather interesting takes on the church. Monty Python and the Holy Grail also happens to be one of the funniest films ever made. 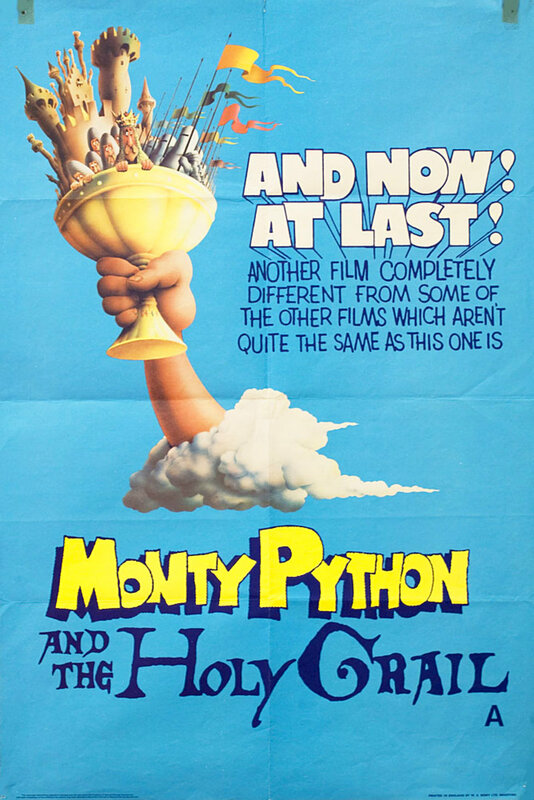 Monty Python started off as sketch comedy series on the BBC first airing in 1969. 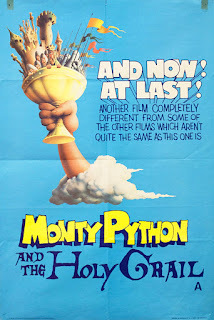 The cast (Graham Chapman, John Cleese, Eric Idle, Terry Jones, Michael Palin, and a cartoonist, Terry Gilliam) decided to parody the story of King Arthur. 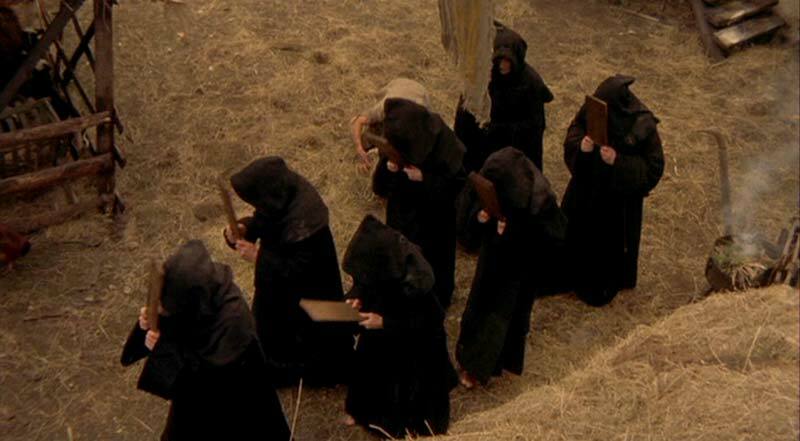 Any story from that time, the middle ages, would have to deal with religion. The film opens with very funny opening credits that include moose. We then see , then a title card reads, England 932 A.D. We then see King Arthur pretending to ride a horse (apparently the budget couldn’t cover actual horses). God appears to Arthur and tells him to search for the Holy Grail (Jesus’ cup from the Last Supper). 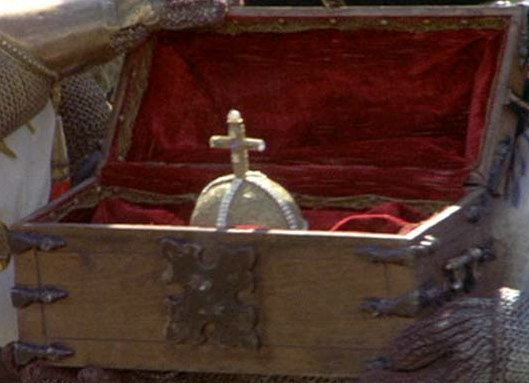 God is drawn by Terry Gilliam as the grouchy, bearded head of a King. It was not a flattering portrayal; mean, narcissistic, and brutal. The first clergy we see in the film is a parade of monks who smack themselves on their heads with boards as they chant, “Pies lesu Domine, Dona eis requiem” (Latin translated roughly as “Pious Lord, give them rest”). There were monks and other “holy men” during the middle ages that hurt themselves; wore hairshirts and whipped themselves. Their pain was intended to pay for the sin for themselves and others -- which is really bad theology, of course. On the cross, Jesus paid it all. As Isaiah 53:3, says, by His stripes we are healed. But watching those monks hit themselves on the head is funny. 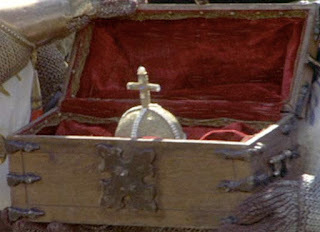 The most prominent member of the clergy in Holy Grail is a firearms expert, Brother Maynard, who carries the sacred relic of the Holy Hand Grenade of Antioch. In order to fight a deadly beast, a bunny (yes, a bunny), he is called in. Sorry for the very long quote. But one gets the feeling that some of the writers (who were also the cast) had to sit through long Old Testament readings in chapel and wanted to convey the tedium they felt. And to be fair, it is the expertise of the priest that brings about the destruction of the killer beast.